Washington Scaffolding Rental - Scaffold Resource, LLC - Scaffold Resource, LLC provides reliable and carefully built scaffolding. Call our Washington staff today at (301) 924-7223! Trenching and shoring play important roles in many construction projects, but as with most things on a jobsite, they come with some safety hazards. Understanding these hazards and taking steps to reduce them will increase the safety of your workers and help to ensure projects are completed on time and without injury or damage. Here is a closer look at some of the hazards that can make trenching and shoring dangerous and what you can do to control them. Equipment falling into an area of trenching and shoring is a common concern on jobsites. Start by making sure that employees are out of the trench whenever there is digging or when items are being raised out of or lowered into the trench. Keep a perimeter area around the shoring and trenching that is kept clear. Workers who are inside the trenching should always wear hard hats and should never work under raised loads. Employees who are working in areas of trenching and shoring must have clean and clear air to breathe. Never allow employees to work in an area with oxygen levels less than 19.5% or more than 23.5% or a combustible gas concentration of more than 20% of the lowest flammable limit. If you are working with hazardous substances, check the threshold limit values for those substances. The atmosphere should be checked regularly. Workers must have a clear way in and out of the work area. If the trenching that is being used is four feet deep or more, then the egress must be fixed. Workers should never be more than 25 lateral feet from the closest egress at any point while working. Ladders must be secured and should raise at least 36 inches from the top of the trenching. Scaffold Resources can provide safe shoring rentals as well as advice for safe usage on your jobsite. If you need shoring or scaffolding in Washington, D.C., please call us at (301) 924-7223. According to experts, 2018 has been a year of booming commercial construction. 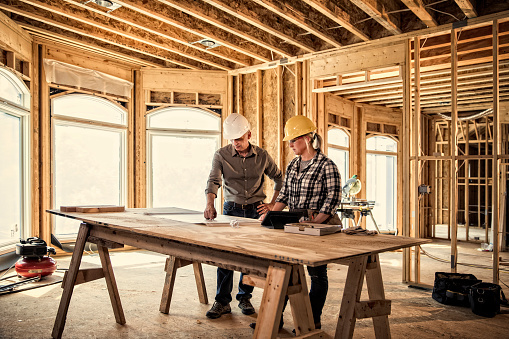 Has your company gotten in on the increasing demand for new construction work? At Scaffold Resource, we make it easy for construction companies to deliver for their customers with fast and safe scaffold rentals, shoring, wall bracing, and more. There are several factors driving the 2018 construction boom. First is increased optimism throughout all sectors of the economy. Business-friendly taxes and growth of the stock market mixed with reduced restrictions mean that commercial entities are ready to spend on new construction. 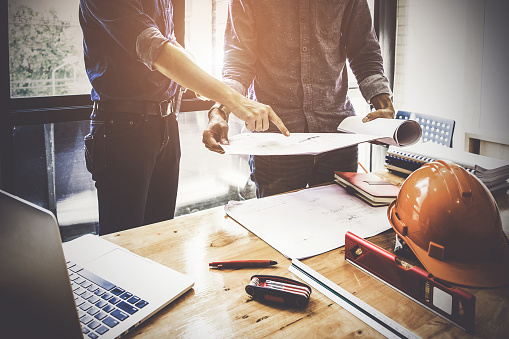 Businesses are seeing increased need for office and commercial space to meet consumer demands and to make space for new staff to satisfy the needs of their market, which makes construction a must for many companies. Be ready to take advantage of new construction jobs with help from Scaffold Resource. Our affordable scaffold rentals in Washington, D.C. are available even on a tight schedule, so you can get to work quickly. Make a reservation for scaffolding today by calling (301) 924-7223. When you’re working on a jobsite, one of the most important pieces of equipment to have is a hard hat. There are different kinds of hats that offer different kinds of protection, depending on whether you’re working on scaffolding, working with electricity, or working in other specialized conditions. Watch this video to learn about different kinds of hard hats. As you choose a hard hat, figure out if you need protection from overhead debris, such as that which may fall from scaffolding or shoring, protection from side impacts, or protection from electricity. Scaffold Resource is committed to jobsite safety and safe operation of our scaffold rentals in Washington, D.C. To find out more about our services, call (301) 924-7223. Construction projects frequently fall behind schedule. Unfortunately, the impacts can be extreme for everyone involved. The construction team faces extra expense that is not in the budget for work hours, scaffold rentals, and other costs associated with a lengthier-than-projected schedule. The customer who commissioned the construction faces inconveniences associated with delayed access to the finished work. Despite these issues, behind-schedule projects are extremely common. What causes these kinds of delays, and is there anything your team can do to reduce the chances of them happening? Here is what you need to know. These factors can all cause delays of different lengths on a construction project. 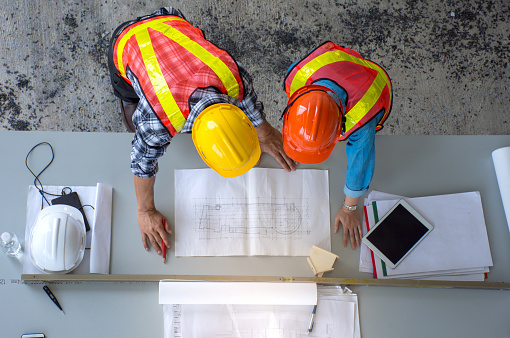 In most cases, these issues are not caused by the construction team, but mitigating the impact of the delays does rely on the onsite construction crew. For this reason, the construction team must do what it can to reduce these causes of delays from being an issue. It is also helpful to be conservative when projecting a timeline, so you have some wiggle room if an issue develops. Scaffold Resource can be part of getting your projects done on time with our shoring and scaffolding rentals. Find out more about scaffold rentals in Washington, D.C. by calling (301) 924-7223. During our many years in business, Scaffold Resource has had the honor to work on some of the nation’s most beloved landmarks. But none of that work is as important as the steps we took to safeguard America’s true national treasures: its children. Our shoring erection project at Brent Wood Elementary was particularly challenging because the school was in operation at the time. Ensuring the safety of each and every child on campus was our top priority on this job. There were other challenges regarding this project’s shoring erection. Namely, that we didn’t have reliable “as built” drawings available, and so our workers had to conduct a full evaluation of the existing old structure. Our engineers designed a cantilevered shoring system that turned certain elements of the building into counterweights. Scaffold Resource is available to provide shoring erection, sidewalk canopies, and scaffolding rentals at your construction site in Washington, D.C. Call our office at (301) 924-7223 to discuss your needs. Every worker has the right to a safe workplace. In the U.S., these rights are protected by numerous laws and regulating bodies, including the Occupational Safety and Health Administration (OSHA). Although safety issues are relevant in every workplace, some workplaces pose more of a threat than others. Workers setting up tube and clamp scaffolding or participating in shoring erection need to be particularly cautious about safety concerns. You can learn more about workplace safety rights when you watch the accompanying video. It explains that workers have the right to ask questions if anything seems unsafe, and to report job-related injuries without fear of retaliation. Scaffold Resource in Washington, D.C. is known for our superior track record of safety, and we work hard to keep it that way. Our workers perform daily hazard analysis on every job, and participate in many other rigorous safety initiatives. Call (301) 924-7223. 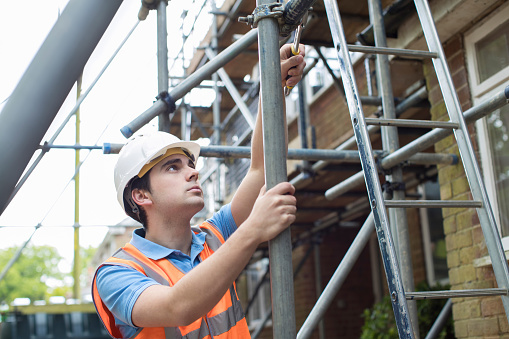 What Are the Training Requirements for Working on Scaffolding? The Occupational Safety and Health Act (OSHA) requires employers to properly train workers to recognize, address, and prevent hazardous conditions. Specific safety training requirements have been developed for various roles within the construction industry, including work performed on scaffolding. Abiding by these training requirements can save lives and reduce the risk of serious, disabling injuries. At Scaffold Resource, we firmly believe that safety is everything, and this is evidenced by the numerous and ongoing safety training initiatives our workers undergo every day. Scaffold Resource in Washington, D.C. can also custom-design safety training programs for your company, including as-needed specialized training and monthly scaffold hazard awareness training. Company representatives can inquire about our training capabilities at (301) 924-7223. All construction operations carry inherent risks, but excavations are widely recognized as being among the most dangerous. Cave-ins and trench collapses pose a grave threat to worker safety, as they cause fatalities and injuries every year. The erection of the proper shoring keeps workers safe. Engineers must assess the type of soil in the area before they can determine the proper method for building shoring. The Occupational Safety and Health Administration (OSHA) recognizes four categories of soil and rock deposits. The first is stable rock, such as granite or sandstone. Solid rock can be safely excavated with vertical sides, as it will remain intact. However, before classifying a deposit as solid rock, the engineer must determine whether the rock contains cracks. Type B soils are also cohesive soils. Typical examples include angular gravel, silt loam, silt, and dry, unstable rock. Type B soils have an unconfined compressive strength between 0.5 and 1.5 tons per square foot. It’s also possible for a soil to be classified as type B if it’s been subjected to vibrations or fissures, but would otherwise be classified as type A soil. Some examples of type C soils are gravel, sand, submerged soil, loamy sand, soil with seeping water, and unstable, submerged rock. 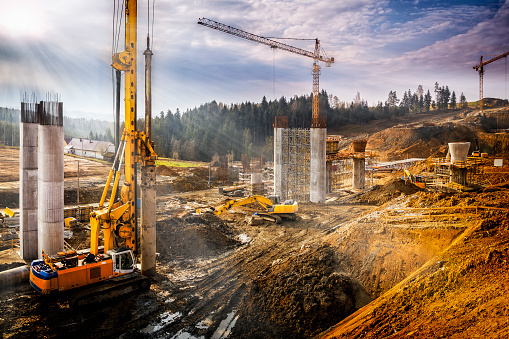 On construction sites, it’s most common for deposits to be classified as type C. These cohesive soils have an unconfined compressive strength of less than 0.5 tons per square foot. 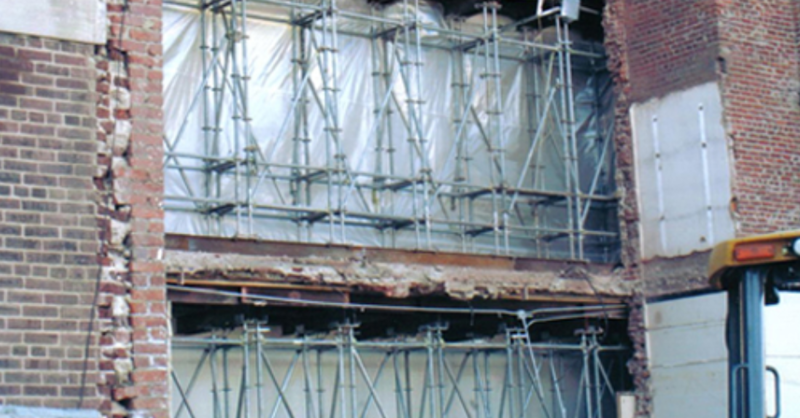 If your company is planning excavation work, you can count on the expertly trained team at Scaffold Resource to provide safe, compliant shoring erection services. Call us at (301) 924-7223. We also offer scaffolding rentals near Washington, D.C. Workplace safety must be a top priority for construction companies. There are inherent risks involved with major projects like shoring erection and scaffolding work, and one of those risks is the possibility of head injuries. All employees should wear hard hats whenever there is a potential for falling objects, accidental head contact with electrical hazards, or contact between a fixed object and an employee’s head. This video offers a simple demonstration of why hard hats are so important. “Melanie,” a watermelon, is wearing a hard hat the first time a brick falls on her. As you can see, there is no cranial damage. The second time the brick falls on Melanie, she lacks a hard hat, and the damage is considerable. Scaffold Resource in Washington, D.C., is a recognized leader in on-the-job safety because we firmly believe that even one serious injury is too many. To have our highly trained, safety-minded employees provide scaffolding or shoring erection for your jobsite, call (301) 924-7223. Jobsite accidents like collapsed walls are every construction manager’s worst nightmare. Even if the accident occurs during off-hours when no employees are present, a collapsed wall can easily lead to major headaches, including construction delays and higher insurance premiums. Only a strict adherence to OSHA regulations and industry standards regarding wall bracing safety can prevent this type of accident from happening in almost any circumstance. The OSHA regulations are uncharacteristically minimalist regarding wall bracing safety. The main code requirement is that all masonry walls taller than eight feet must be adequately braced until the permanent supporting structures are installed. Because the official regulations can be subject to interpretation, the Mason Contractors Association of America (MCAA) developed its own industry standards. This resulted in the widely accepted and used Standard Practice for Bracing Masonry Walls under Construction guidelines. Mason contractors and project managers are strongly encouraged to follow the Standard Practice and consult its tables regarding the proper installation of bracing. One of the first steps for proper wall bracing is to establish the restricted zone based on the wall’s height. The restricted zone should be on the side of the masonry wall opposite the scaffolding, if scaffolding is up. Once the scaffolding is removed, the foreman must establish the restricted zone on both sides of the wall. For the sake of simplicity, mason contractors can tape off the restricted zone based on the height the wall will be once it’s completed. Otherwise, the boundaries must be re-established as the wall grows higher. For maximum protection from damaging winds, a minimum of two braces must be installed for each wall panel. Note that the national Building Codes prohibit a space greater than 25 feet between control joints. Finally, there must be 20% of the wall between any given brace and the nearest control joint. Scaffold Resource is a leader in construction site safety. We provide safe wall bracing, shoring erection, and scaffolding rentals at sites in Washington, D.C., and the surrounding areas. Call us today at (301) 924-7223 and let us know how we can help you make your construction zone as safe as possible.